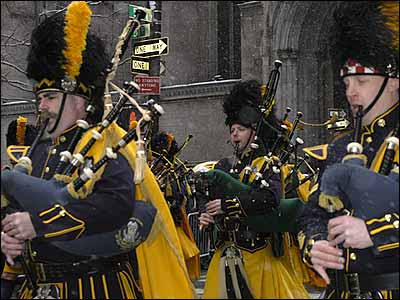 The sounds of bagpipes usher in one of the city's most festive Holiday celebrations. Wear something green and claim Irish heritage for a day. Mayor Bloomberg and Cardinal Egan will kick things off as thousands line Fifth Avenue from 42nd to 86th Street to watch the parade. Long before it ends, every bar and pub in the city will be packed with lines of people trailing out the door as the Guinness flows freely. Amidst the spirited revelry, gaiety and leprechaun hats, it’s easy to forget the reason for celebration, the Patron Saint of Ireland’s feast day. Look closely at the cumbersome pipes carried proudly by men in colorful kilts, the tartans of their clans. Those pipes have witnessed three thousand years of Celtic History. Their shrill haunting music mirror not only the lush beauty of the land from which they come but the lilting rhythm and cadence of the Gaelic language. Make this St. Patrick’s Day a special memory. Unless you visit the far reaches of the Irish Isles or Scotland’s Outer Hebridian Islands, you will not get to hear this live. Experience the rare beauty of the Celtic language first hand at a Mass sung in Gaelic at St. Agnes Church steps from where the parade begins. The tiny Church, tucked away on 43rd Street off Lexington Avenue, is a beautiful setting for the 10 AM Service. Get there early, this promises to be a standing room only affair. A few words on Ireland’s Patron Saint. Born on the West Coast of Britain, present-day Wales, around 385, as a boy, Patrick narrowly escaped death when Celtic pirates raided his village. Abducted, taken to Ireland, then sold into slavery, he spent several years of privation and hardship among pagans whose language he struggled to learn in order to survive. As a young man, he risked his life to escape his captors, negotiated passage on a ship sailing to Gaul (France) and eventually found his way back to his family. Years later, in 432, he returned to Ireland as a priest determined to bring Christianity to the people who had enslaved him. His feast day and the soaring Cathedral built to honor his memory celebrate his success at turning a bad experience into something wonderful. Address to remember: St. Agnes Church, 141 East 43re Street, between Lexington and 3rd Avenue, New York, NY 10017, 212 682-5722. St. Agnes also offers Latin Mass in Gregorian Chant every Sunday at 11 AM. Directions: From Times Square MTA S (Shuttle) to Grand Central Station, walk one block. Bus M101, M102, M103 to 42nd St.